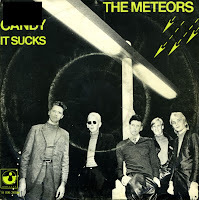 Taken from the Meteors' 1980 album 'The hunger', 'Candy' was another unsuccessful single for the band, as it didn't chart. I didn't know the song when I bought this single, but I was really passionate about the other single from the same album, 'Together too long'. Unfortunately, this single is a lot less engaging. The Dutch band Meteors was founded in 1977 Ferdinand Bakker, Job Tarenskeen and Hugo Sinzheimer. They enlist three more musicians: Åke Danielson, John Vee and Erik de Zwaan. In 1979 they record their debut album 'Teenage heart', which contains the minor hit 'It's you only you'. 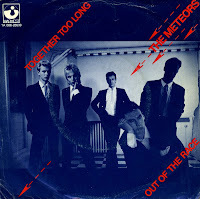 'Together too long' is the lead single from their second album 'Hunger' (1980), which is recorded after Tarenskeen, Vee and De Zwaan quit the band. They are replaced by Kim Haworth and Gerrit Veen. 'Together too long' is by far the most intense song the group ever recorded, but like the other singles it doesn't reach the higher regions of the Dutch Top 40.